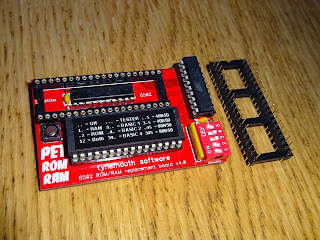 This is a new version of my 6502 ROM RAM boards, this one specifically for upgrading or replacing ROM and/or RAM inside a Commodore PET. 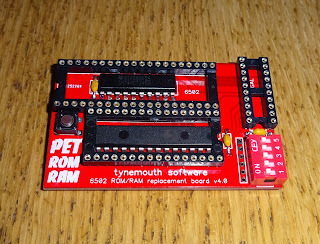 To use, remove the 6502 CPU from it's socket and plug in the PET ROM RAM board. 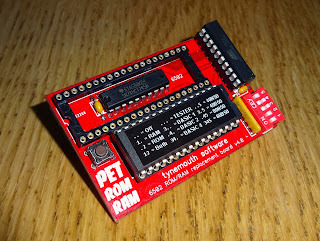 The original CPU then plugs into the socket on the PET ROM RAM BOARD. 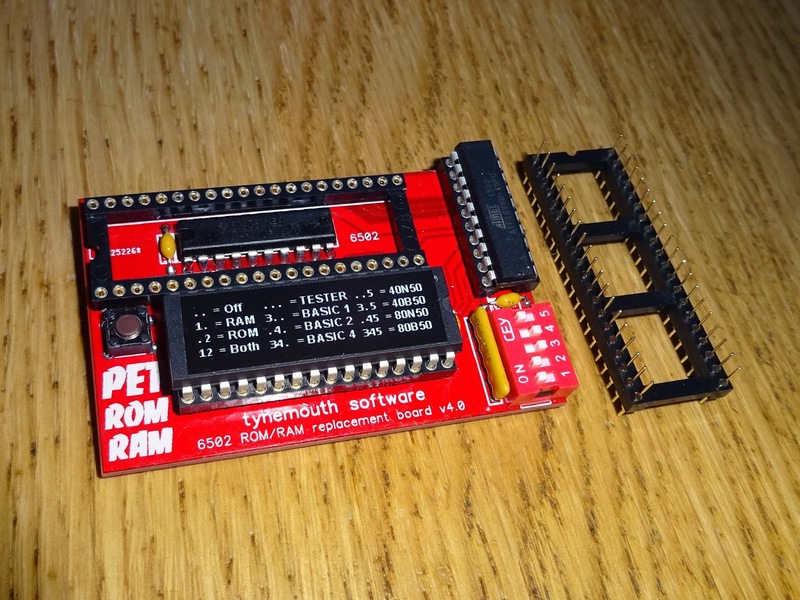 It can now replace all the system memory (32K) and ROMs. I have been making various versions of this for a while now, this new PET ROM RAM is a smaller version of the 6502 ROM/RAM boards. 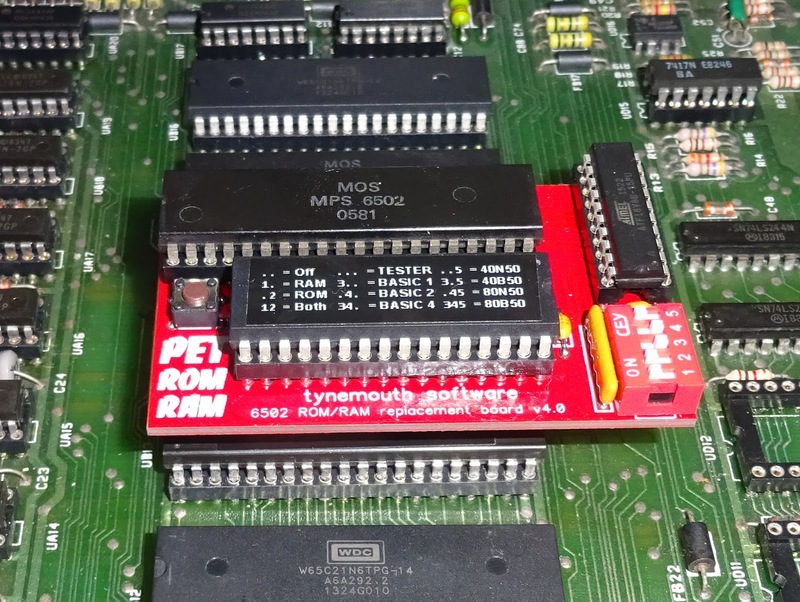 It allows you to replace the ROM and RAM in a Commodore PET to either bypass faulty parts, or upgrade an existing system. 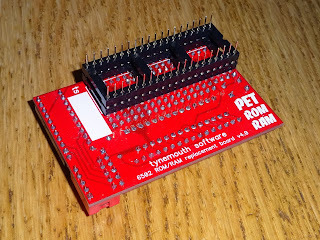 So if you have a PET with faulty RAM you can use this to replace that. 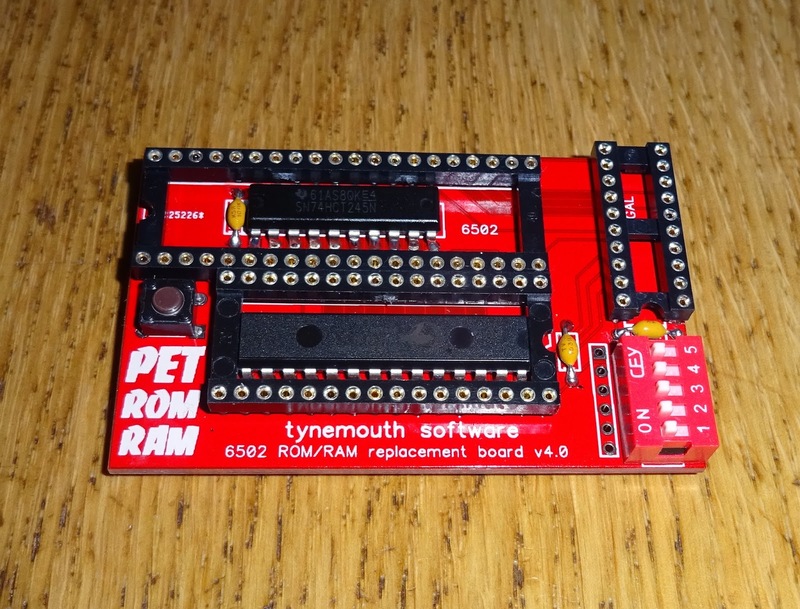 You can also use it to upgrade any PET from a 2001 with 8K and BASIC 1 onwards to the full 32K RAM and BASIC 4. (BASIC 2 or 4 is required to use an IEEE-488 disk drive, such as the PET microSD). 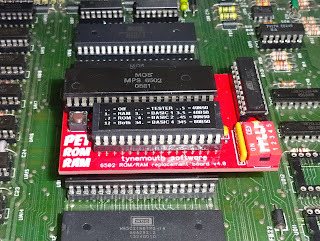 Although this is smaller than the full size board, it has all the same chips, the RAM chips is now hidden under the ROM. It does have fewer DIP switches, so cannot be used to select individual ROMs or banks of RAM to replace, but for most users, it will only be used to enable all the upgrades and run at full capacity. The original versions are still available if you do need to diagnose faults. 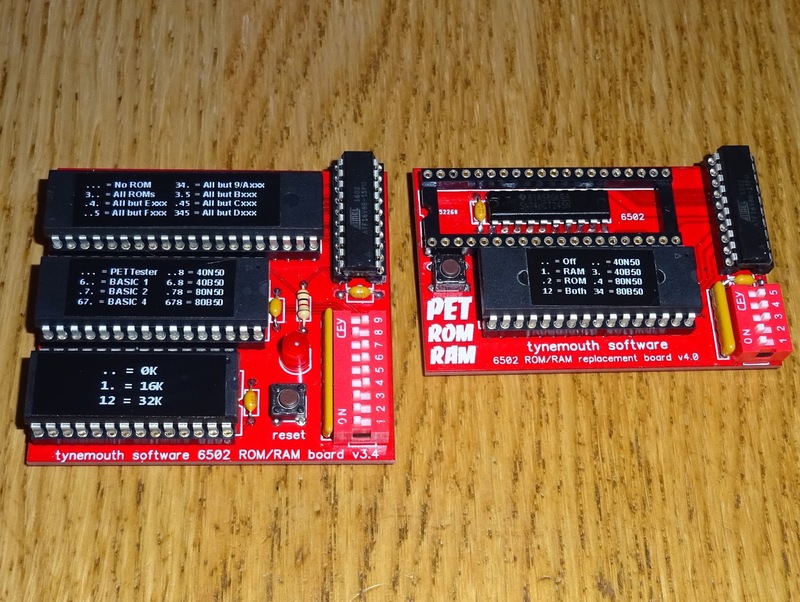 These are supplied with ROMs for both the original range of Commodore PET machines without a CRTC chip (6545), starting with the original 2001, and the 2001N range, 30xx, and the 9" 40xx machines, includes the PET tester ROM, BASIC v1, BASIC v2 and the final BASIC v4.0. 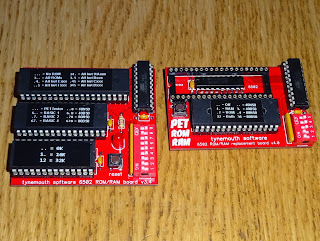 The other 4 ROM selections are for later CRTC based PETs, the 12" 4032 and 8032 machines. This includes 40 and 80 column ROM sets for Business and Normal keyboards (note you need 40 column hardware to use 40 column ROM sets and 80 column hardware needs 80 column ROMs). The board is supplied with a double sided pin header socket which plugs into the bottom of the board and fits into the original CPU socket. The pins are thin like IC legs, so shouldn't cause any damage to the sockets, they are not the big square pins used for jumpers etc. Some very early 2001 systems have sockets with tall sides, so the bottom of the chip is lower than the top of the socket. This sort of pin will not work in those sockets. I can build a version with suitable long thin pins for those. 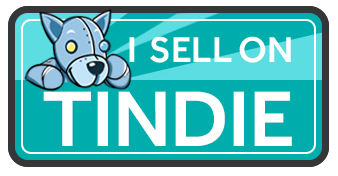 These boards are available to buy from my Tindie Store. You can order one of these boards below, select the appropriate options and within the UK or international postage.